Acceptances once again prove to be like buses this month, with a second story sign-up following close on the heels of last week’s good news. 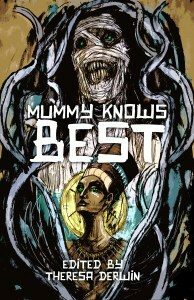 This time round, I’m delighted to announce that my short story ‘Aleiodes‘ will be featuring in Terror-Tree‘s ‘Mummy Knows Best‘ anthology, due out this Autumn. Having set out to come up with something a bit left-field on this one, I’m quite pleased with the end result and am looking forward to seeing it in print. Fingers crossed the anthology will be launching at this year’s Fantasycon down in Peterborough, and I’ll share more details when they become available nearer the time. Until then, here’s a peek at the draft cover art which, as you may have already guessed, makes it clear that we’re not talking about the maternal instincts here.